Dr. Lawrence Wittner (http://lawrenceswittner.com) is Professor of History emeritus at SUNY/Albany. His latest book is a satirical novel about university corporatization and rebellion, What’s Going On at UAardvark? Despite the central role of women in the environmental movement, surprisingly little is known about them. Furthermore, what is known is usually limited to the work of Rachel Carson, whose powerful call to action, Silent Spring (1962), is widely credited with jump-starting the modern environmental movement. But, as shown by Robert Musil’s new book, Rachel Carson and Her Sisters, Carson is merely the most visible of numerous women who have had a powerful impact upon how Americans have viewed the natural environment and sought to preserve it. Musil points out that, as the nineteenth century progressed, increasing numbers of American women obtained better education and the ability to travel, write, and take action. They hiked, explored, and botanized, while observing the encroachment of manufacturing and urban life on the countryside. Although restricted by gender discrimination from playing top roles in academia, the professions, and publishing, they nonetheless produced a flood of books, magazine articles, journals, and children’s stories, many of them about nature. In addition, Martha Maxwell began the development of natural history museums, while Susan Fenimore Cooper became active in the movement to stop the slaughter of birds for fashionable women’s hats. Cooper, daughter of the famed American novelist, was immensely influential. Her book, Rural Hours (1850), a best-selling environmental work, underwent four decades of popular publication and revision, in the United States and overseas. Numerous very popular writings of hers followed. Fluent in three languages and often residing abroad, Cooper moved in the highest circles of intellectuals, scientists, and naturalists. Other key activists included Graceanna Lewis (a popular ornithologist, as well as a painter); Ada Botsford Comstock (who spread nature study throughout the nation); Florence Merriam Bailey (an organizer of bird-lovers and the most eminent female naturalist writer and organizer of her time who was well-connected to the male-dominated worlds of science and Washington policy); Olive Thorne Miller (a children’s author and environmental educator); and Mary Hunter Austin (a well-known writer about nature but, also, a campaigner against the diversion of water resources to insatiable Los Angeles). By the twentieth century, a nationwide conservation movement had taken shape --one within which women played an important role. Many of these women lived unorthodox lives. Maxwell, though a vegetarian, gathered her animal and bird specimens by shooting them with a rifle--something considered scandalous when done by women. Lewis was active in the Underground Railroad and the women’s suffrage movement. Bailey combined her ornithology with social work. Austin, a poet and mystic, wrote thirty books, was friends with Jack London, Upton Sinclair, and Willa Cather, and was active in the suffrage and birth control movements. Their pioneering work was later supplemented by Ellen Swallow Richards and Alice Hamilton, who were keenly attuned to the growing industrial age in America and focused their attention on the plight of poor workers and urban landscapes. Richards, who first introduced the concept of ecology to the United States, launched associations, founded disciplines, and pioneered health and environmental studies. The first American woman admitted to a high-level science institute of any kind, she performed brilliantly in her field of chemistry. She was also, Musil observes, “in effect, the founder of the American consumer, nutrition, health, and right-to-know movements.” In addition, Richards was a founder of what became the American Association of University Women and chaired its executive committee, authored numerous books, organized the scientific examination of food, and helped the Massachusetts legislature pass the nation’s first pure food laws. She completed the most comprehensive water quality survey in the nation, which sparked the state’s first water quality laws and sewage treatment, and led the campaign to expose the dangerous health conditions in Boston’s schools, thus stirring local and nationwide school reforms. Hamilton, “the founder of occupational and environmental medicine in the United States,” was trained as a doctor. Employed at the Women’s Medical School of Northwestern University in Chicago, she went to live in Hull House, an institution that drew a number of women environmental activists into its orbit. Here she began to focus on occupational and environmental disease. In 1908, the Governor of Illinois appointed her as the chief medical investigator of a new nine-member commission to study industrial disease in the state. Turning up dramatic indications of lead poisoning, she spoke at numerous conferences and was invited by the U.S. Commissioner of Labor to conduct a nationwide study of the lead industry. A new state law regulating lead, the first in the nation, was passed in Illinois, and similar laws followed elsewhere. While continuing to expose industrial conditions, Hamilton became deeply involved in the peace movement during World War I, attending peace congresses and supporting peace plans developed by Jane Addams and the Women’s International League for Peace and Freedom. After the war, she joined the faculty of the Harvard Medical School as assistant professor of industrial medicine. Thriving in this role, Hamilton became the leading American expert on diseases caused by exposure to industrial pollutants, such as benzene, mercury, and lead. Many women activists experienced substantial gender discrimination, and were passed over for appointments or denied admission to academic and other institutions. Richards was initially rejected for admission to MIT as a regular student and, despite her later outstanding record, was subsequently refused admission to its doctoral program. Offered a position at Johns Hopkins, Anna Baetjer was informed that it was contingent on promising not to marry. Hamilton was told, when hired at Harvard, that she would not be allowed to use the faculty club or to sit on the platform with male faculty at commencement. Musil shows that, although Carson herself worked well with men, her deepest influences, relationships, networks and insights, her love of nature and science, her influential and political contacts, and her intimate personal support came from women. In the early 1940s, she and her associates were concerned about the possible toxic effects of DDT. But, when Reader’s Digest rejected her 1945 proposal to write an article on DDT’s dangers, she turned the direction of her freelance writing elsewhere, ultimately producing The Sea Around Us (1951), a best-seller that made her famous. Now financially secure, she left her job at the U.S. Fish and Wildlife Service to concentrate on writing. She worked closely with environmental activists in planning, researching, and writing Silent Spring and, together, they conducted an enormous publicity and organizing campaign for the book, which achieved their goal of alerting the public to the dangers of pesticides and securing government reform. Deeply committed to this cause, as well as to ending nuclear weapons testing, she continued to write Silent Spring, appear on television, and testify before Congress while she was dying of breast cancer. 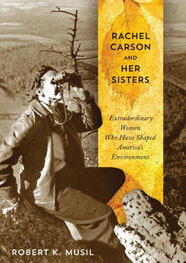 After Carson’s death, women’s leadership in the environmental movement continued. Terry Tempest Williams, an environmental writer and antinuclear activist, relied, like Carson, on imagination, empathy, and science, and, Musil remarks, was her “metaphorical” and “spiritual daughter.” Another key writer and activist was Sandra Steingraber, who focused on environmental cancer. A poet and biologist, Steingraber played an important role in securing the Stockholm treaty of 1981, which banned persistent organic pollutants (such as pesticides)--a treaty that has yet to be ratified by the U.S. Senate. There was also Devra Davis--a passionate writer who argued that millions had died from modern industrial pollution, and more would in the future, unless remedial action was taken. Moreover, Theo Colborn, a former pharmacist and sheep rancher, became a leading environmental researcher, exposing how synthetic chemicals (such as PCBs) caused animal and human endocrine disruption. Musil emphasizes the enormous corporate resistance to environmental safety. Although lead is a neurotoxin that lowers IQ and impairs mental performance, “the National Lead Company fought product labeling, not to mention bans; brought lawsuits; and finally, when the danger was undeniable,” blamed children and their families when children consumed lead paint chips. The DuPont Corporation squelched research showing the connection between the chemical dyes in its factories and cancer. The auto corporations battled against the Clean Air Act of 1970. There was also a sharp struggle over leaded gasoline, which had been an issue since the 1920s, when Standard Oil and the Ethyl Corporation “went to great lengths to keep industrial fatalities secret.” The Electric Power Research Institute (the industry group representing coal-fired utilities) hired researchers to challenge any evidence, methodology, or doubt about the hazards of burning coal. When Dow Chemical’s own research revealed that benzene was causing damage to chromosomes, the company pulled the plug on funding for the research. Also, industry fought fiercely--and successfully--every attempt to restrict, remove, or ban cancer-causing, arsenic-treated wood used for children’s playgrounds, outdoor decks, and picnic tables. Musil contends that, despite the corporate assault on environmental activism, the environmental movement has grown into “the largest reform movement in American history.” In Washington, DC alone, there exist 34 national environmental organizations with an estimated twelve million dues-paying members, millions more electronic activists, and local chapters in every state in the nation. And women remain at the center of the campaign. People who want to learn more about this path can turn to Rachel Carson and Her Sisters for a richly detailed, documented, and eloquent history--a ground-breaking account of undaunted American women, determined to prevent environmental catastrophe.